We can also bend "forward" at the hips, i.e. "hunch forward" to balance over the outside ski, in the bottom part of the arc. Coiling allows this movement to be combined with hip angulation in balancing over the outside ski, see coiling and Get over the outside ski for more discussion. 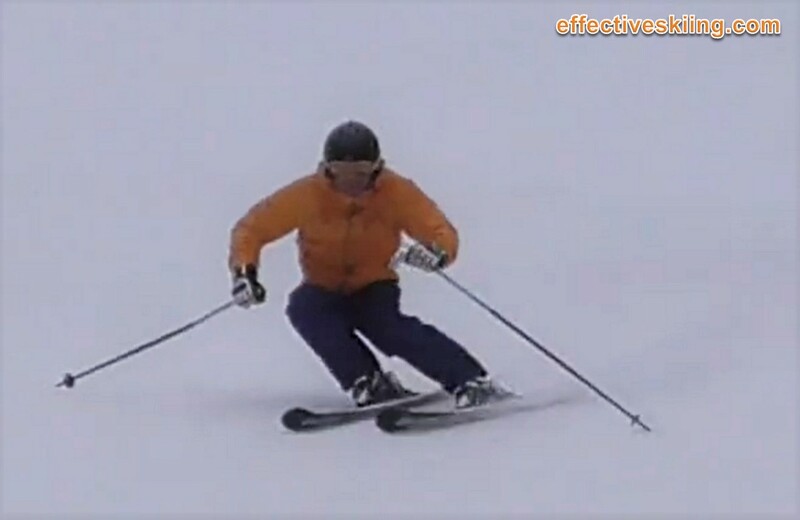 Some consider this bending forward at the hips to be creating angulation as the skis cross the line of travel3, referring to angulation as a general concept of creating angles with the body over the outside ski. So... what exactly would you do if I asked you to "angulate"? Because of the fuzziness of this term, we prefer the term counterbalancing throughout this website, which is a very specific lateral movement and counteraction, which is a specific rotational movement. Our view is that counterbalancing is the lateral movement, that creates angulation. Counteraction is a rotational movement that also contributes to angulation, as the skis cross the direction of travel (or even earlier, in high-performance skiing). However, the focus is on these movements, not the geometrical positions. A specific form of angulation, where you are crunching sideways at the hips more than curving the spine, depending on the needs. It is the most common meaning of the term "angulation" and is somewhat similar to Counterbalancing, see Counterbalancing for more information and drills etc. Sometimes you will see references to "knee angulation" to mean a sideways angulation at the knee, which is not a good thing, as the knee is a hinge joint with a minimum lateral range of motion. In this case, you may be tempted to think "knee angulation" and drive the knees into the hill, possibly with some Femur rotation. But that is suboptimal. It is more effective to use flexing and manage pressure appropriately. It was prevalent in the days of the straight skis4, which required a lot of edging, but not really necessary with modern equipment. We certainly could ski quite square, bank into turns in good skeletal alignment and forego angulation, but it would limit our angles and compromise our balance and edge hold, not to mention introducing an inefficient pendulum torso movement. The reason we create angulation is to allow more tipping than otherwise... which allows more angles, shorter turns, more grip and effective speed control on carving skis. Also, it moves more effective weight over the outside ski, increasing the hold of this ski, while the flexed joints also improve balance, as we can absorb impulses and react better, with more range of movement. See Get over the outside ski. We prefer to see all skiing as requiring angulation. How much exactly is mostly a matter of speed and turn shape, but even a little angulation can go a long way. Too much speed may put a big strain on the back if you go in with a lot of angulation. 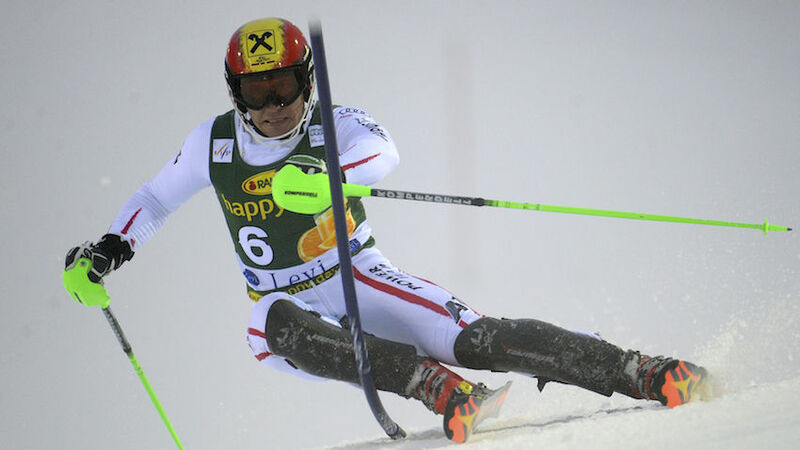 Although it can be mitigated with coiling, in speed events, at the apex, where the pressures are at maximum, it is more common to have less angulation, although in GS these days, there is more and more angulation, as athletes try to get the skis more and more on edge. 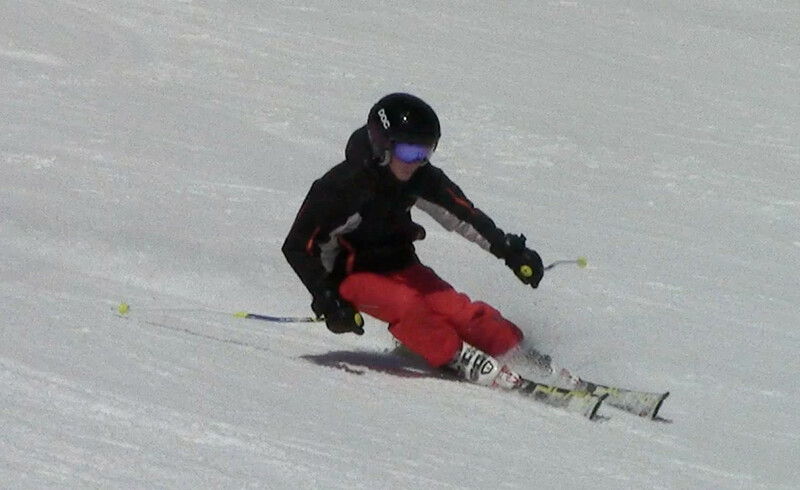 In technical skiing, short/medium turns, too little angulation will reduce the hold of the outside ski. It would also tend to create a pendulum motion of the torso. 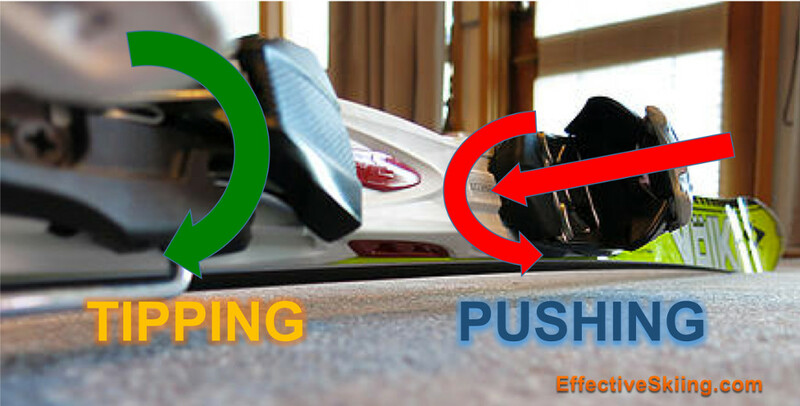 It is not effective to drag the skis on edge with the upper body, so we do not see edging as a result of angulation/inclination, but as the separate movement to tip the skis on edge from the feet and ankles. In ski racing and high-performance skiing, the focus is always on separating the lower and upper body and the upper is used for balance4. In this sense, angulation of the upper body (hips, spine) follows tipping, to allow bigger tipping angles and balance over the outside ski, so an effective use of "angulation" is more in the sense of counterbalancing, to complement tipping the skis on edge. Angulation is really defined from the viewer's perspective, it is more of a geometrical concept. The skier not skiing in front of a big mirror will not appreciate the angulation: the viewer does. So it represents instruction and feedback from the viewer's point of view rather than the skier's point of view. Sometimes the concept of angulation is taken away from the planes of movement, when speaking of "separation creating angulation"3 because if you bend forward at the hips and then turn to the side, a viewer would see the result as a lateral angle. Also, sometimes angulation is seen as an application of the principle ofseparation. In modern ski instruction, the notion of alignment is preferred to "angulation" more and more, as in creating and maintaining alignment over the outside ski, in recognition of the fact that, as the skis turn throughout the turn, the needs for balancing on them are changing throughout the turn as well, as a continuous and coordinated play between separation and angulation or between counterbalancing and counteraction. Viewed 3688 times ( | Print ) this page.